Joe Parkin, one of the first Americans to race in Europe, will autograph copies of his just published memoir, A Dog in a Hat: An American Bike Racer's Story of Mud, Drugs, Blood, Betrayal, and Beauty in Belgium at Interbike. Meet Joe, get an autographed copy of the book, and enjoy a Belgian beer. 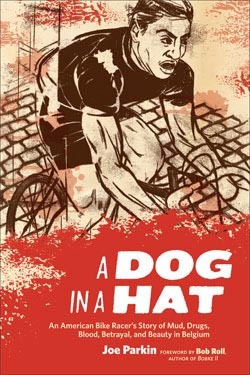 A Dog in a Hat is available now in bookstores, bike shops, and online. Thursday, September 25th, 5-6 p.m. In 1987, "Lobotomy Bob" Roll told Joe Parkin to go to Belgium to become a pro bike racer. Riding along a canal in Belgium years later, Roll encountered Parkin, who he describes in the book's foreword as "a wraith, an avenging angel of misery, a twelve-toothed assassin". Roll barely recognized him; Belgium had forged Parkin into a pro, and changed him forever. A Dog in a Hat is the remarkable story of Joe Parkin. Parkin was an amateur bike racer in California when he met Bob Roll, a pro with Team 7-Eleven. To become a real pro, Bobke told Joe to go to Belgium, host to cycling's most grueling race scene. In 1987, Parkin left the familiar comforts of home for the toughest place in the world to race a bike. As one of the first American pros in Europe, Parkin was what the Belgians call "a dog with a hat on" - something familiar, yet decidedly out of place. Parkin's memoir reads like a novel. In plainspoken, fast-paced prose, Parkin describes the true life of the professional bike racer, putting the reader into the whirlwind of this hardest of athletic educations. A Dog in a Hat begins with Parkin's terrifying first visit to his team doctor, where he is strapped to a table and monitored by humming electrodes as men in white lab coats coldly divine his future as a pro. A Dog in a Hat celebrates the glory of bike racing, but Parkin tells the hard reality of the life - the drugs, the payoffs, the betrayals by teammates, the battles with team owners for contracts and pay, the endless promises that keep you going, and the sheer physical agony of racing day after day. Despite the pain, despite the suffering, A Dog in a Hat is a beautiful book. It is one American's story of his love affair with professional cycling, set in the hardest place in the world to be a bike racer. It is a story untold until now, and one that Parkin's readers will never forget. Joe Parkin represented the United States at the World Professional Cycling Championships and the World Cyclocross Championships. Following his road racing years in Belgium, he returned to the United States and began a successful second career as a pro mountain bike racer. VeloPress is an endurance sports and fitness publisher. VeloPress is the book publishing division of Competitor Group, Inc., publisher of VeloNews, Triathlete, Inside Triathlon, and Competitor magazines.